Gail Wise, 76, of Park Ridge, Illinois is the first buyer of a 1964 Ford Mustang. 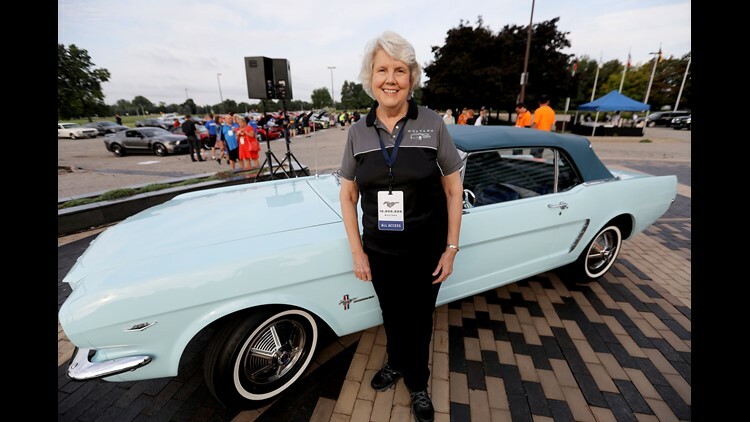 She and the car are at Ford world headquarters in Dearborn celebrating the building of 10,000,000 Mustangs on Wed., Aug 8, 2018. DETROIT -- Tom and Gail Wise disagreed about whether a broken-down car should be stored in a family garage for 27 years or sold for junk. He insisted they keep it because, he promised, one day he would find the time to fix the vehicle himself. One day, it just stopped running. And there it sat until Tom retired. When he started hunting for car parts on the internet, he discovered a story about someone with a similar car who claimed to be the very first Mustang owner, with a purchase date of April 16, 1964. They called Hagerty Classic Insurance, experts on collector cars, and learned a paper trail was essential. So now, as Ford celebrates production of the 10-millionth Mustang, Gail Wise is back in the spotlight. She was at company headquarters last week and, from Thursday through Saturday this week, her Mustang will be on public display in Royal Oak, Mich. Her story, she notes, is filled with luck and mystery. The original 1965 Ford Mustang convertible in Wimbledon White -- the early version known to many as the 1964 1/2. Mustang went on sale on April 17, 1964 and sold more than 418,000 in the first 12 months. The sixth-generation, redesigned 2015 Mustang. Company head Henry Ford II with the 1964 1/2 Mustang Ford at the cars unveiling at the New York World's Fair in Flushing Meadows, N.Y. on April 17, 1964. The 1965 Ford Mustang hardtop in the Ford Pavilion at the 1964 New York World's Fair where the car was introduced April 17, 1964. 1964 Ford Mustang ad from the New York World's Fair. 2010 photo of Gail Wise, with her 1965 Ford Mustang convertible, the very first one sold. She still owns it and it has been restored. 25th anniversary model 1990 Ford Mustang convertible with and orginal 1965 Mustang convertible. 2003 Ford SVT Mustang Cobra. 2004 Ford SVT Mustang Cobra. The 2007 Ford Shelby GT500 seamlessly combines the modern Mustang muscle car with classic Shelby performance cues, such as the famous Shelby Cobra logo. The 2007 Ford Shelby GT500 with lower bodyside racing stripes and Le Mans-style stripes from nose to tail, inspired by those featured on classic Shelby Mustangs. 2008 Mustang "Bullitt" special edition -- recalling the 1960s movie and famous Steve McQueen chase scene on the hills of San Francisco. 2014 Shelby GT500: which has a 662-hp. aluminum 5.8-liter supercharged V-8, making it the industry's most powerful production V-8 engine. The new third-grade teacher was living at home with her parents on the northwest side of Chicago and sharing her father’s red and black 1957 Ford. But she had accepted a job in the suburbs. So Helen and Cleadis Brown agreed to lend their daughter money for a new car and they headed over to Johnson Ford on Cicero Avenue. 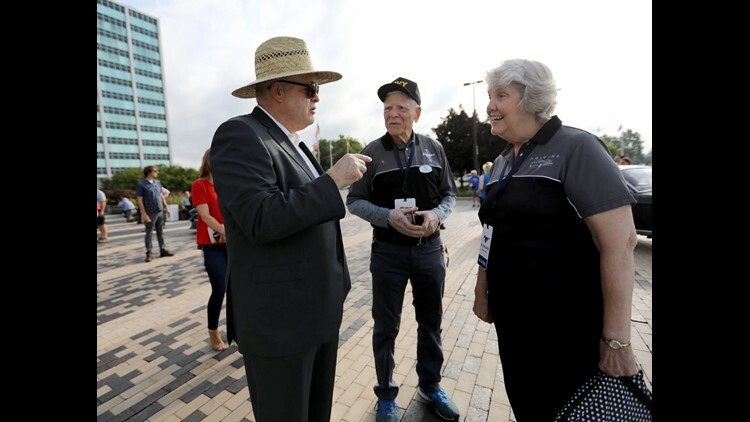 Ford CEO and President James Hackett, left, talks with Tom and Gail Wise of Park Ridge, Illinois about their 1964 Ford Mustang convertible at Ford world headquarters in Dearborn celebrating the building of 10,000,000 Mustangs on Wed., Aug 8, 2018. Back then, new cars always came out at the end of September and Ford wanted to shock the world with an April reveal. 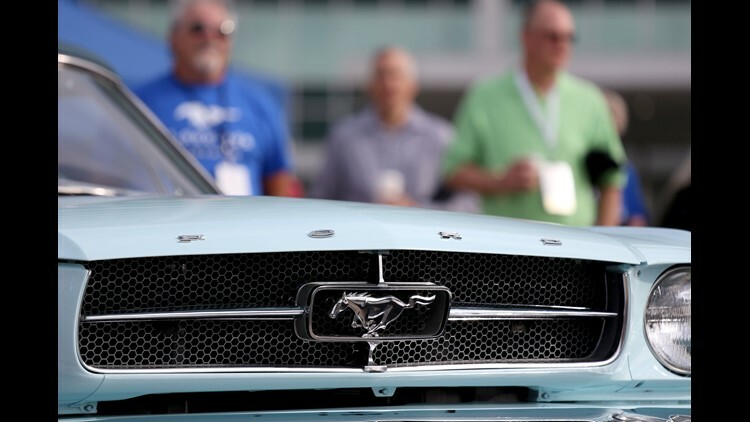 The company had distributed Mustangs to dealerships around the country so salespeople would have something to show when Lee Iacocca unveiled the car at the World’s Fair in New York on April 17, 1964. She married two years later, bought a home and used the Mustang as a family car with four kids. “You just didn’t go out and buy new cars,” Wise said. “Tom was using it for work. We could fit three kids in the back seat and I’d hold the youngest on my lap. We would go to McDonald’s and eat in the car. And then one day, he pushes it into the garage. I wanted to get rid of it because we needed space for children’s stuff. He kept saying, ‘It’s my retirement project.’ "
He built an addition onto their two-car garage for the Mustang. Today, the car has just 68,000 miles. 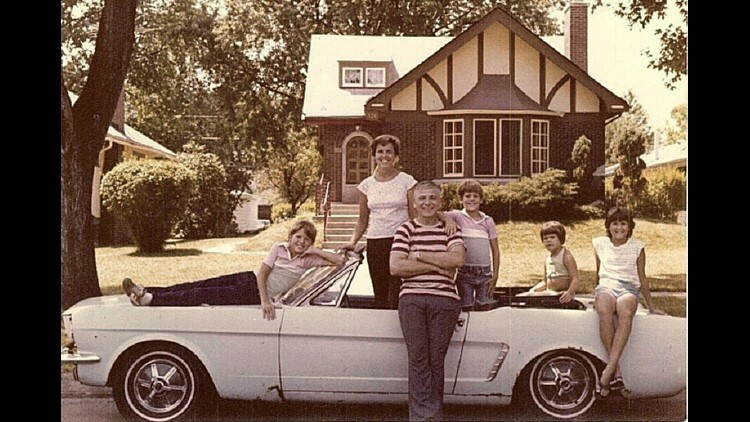 The Wise family, Tom and Gail with their four kids, shot a Christmas card picture in July 1979 with the Ford Mustang. Shortly after, Tom pushed the car into the garage for 27 years. Now the fully restored (but not altered or modified) classic pony car that cost $3,447.50 is worth $350,000 to $450,000, according to Jonathan Klinger, spokesman for Hagerty in Traverse City. Gail Wise said she only wishes her mom and dad could be here. “I’d like to ask them questions," she said. "We went out on Wednesday, April 15, 1964, to buy me a car. Right in the middle of the week.They worked such long hours." Her father worked as a cook and her mother worked as a waitress in their family-owned restaurant near Armitage and Grand avenues. The grill on the 1964 Ford Mustang owned by Gail Wise, the first Mustang sold. It is at Ford world headquarters in Dearborn during the event celebrating the building of 10,000,000 Mustangs on Wed., Aug 8, 2018. Stories about Mustangs leave even industry analysts a little stunned. The insane love for Mustang reflects nostalgia for a time when the muscle car war was just getting going and America had a can-do attitude before Vietnam and Watergate. So it’s no surprise to anyone that Gail Brown stopped traffic in Chicago. Ford invited Tom and Gail Wise to come to Detroit this month to celebrate the Mustang milestone, and the Dearborn, Michigan, automaker shipped the Mustang out from Illinois. Their garage these days houses a 2013 Ford Escape and a 2015 Ford Edge. They can’t believe that, for so many years, the family stacked lawns chairs on the Mustang.